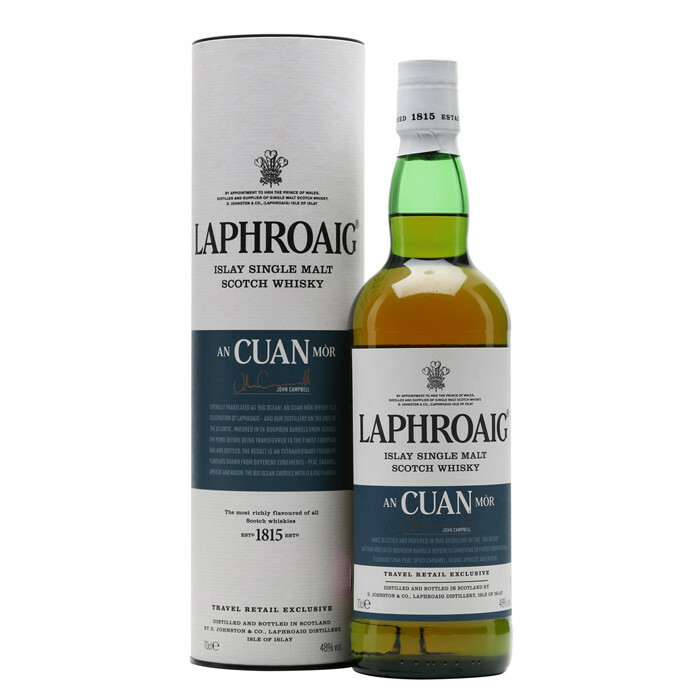 An Cuan Mòr is one of the selection of Laphroaig single malt Scotch whiskies released for the Travel Retail market. For the An Cuan Mòr, which means 'Big Ocean' in Gaelic, the whisky is initially matured in first-fill American white oak bourbon barrel and then finished in European oak casks. Nose: Big burly peat complimented with notes of salt, iodine, caramel, butterscotch and red fruit with a lovely malty sweetness tying it all together. A nice aroma all around. Palate: Peat, salt, iodine, spice and a nice fruity sweetness loll across the palate and give way to light notes of dark sweets and dried strawberries. Finish: Long and winding fade of peat, iodine, charred citrus and a fruity malty sweetness.